HomeKit support will enable users to lock and unlock their homes by using Apple's new Home app on iOS 10 or the free Yale Assure companion app (U.S. and Canada only) for iPhone and iPad. Homeowners can also use Siri voice commands such as "Hey Siri, lock the front door" and "Hey Siri, is my front door locked?" Users are also able to check a lock's battery and current lock status, create up to 12 unique pin codes, customize lock and notification settings, name a lock, and add a new lock through the Yale Assure app. Users with a third-generation Apple TV or later can control HomeKit accessories in the Home app while away from home. Yale said the HomeKit module will also be compatible with its recently launched nexTouch Wireless smart lock targeted at small business owners. The new HomeKit-enabled smart locks and standalone HomeKit module are expected to be available for purchase on Yale's website at some point in March. Pricing was not disclosed. 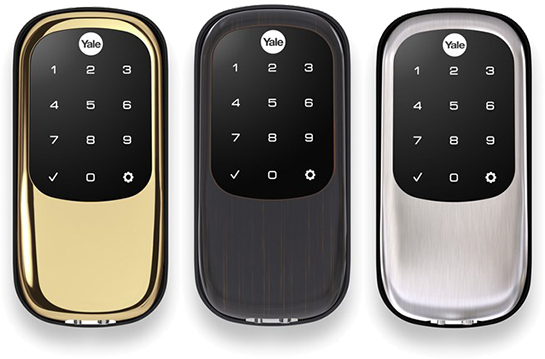 The non-HomeKit Real Living Assure locks retail for $199.99 on Yale's website in polished brass, satin nickel, and dark gray colors. ZigBee and Z-Wave modules are also available for $50 each. Here's an installation video. If someone wants to get into a home badly enough, they'll just shatter a window, break the door down, or destroy the deadbolt. These "smart" locks are all about convenience, nothing more. A few years ago, I was locked out of my home in the middle of the night and, unfortunately, I had to call one of those fly-by-night locksmiths because none of the reputable companies in my area were answering their phones at midnight. The guy who showed up looked like he could've just gotten out from doing 5 to 10 for breaking and entering. He had the deadbolt drilled out and my back door open in less than three minutes. Alexa why don't you work when I am not in the room? The big question here will be if you can get alerts/notifications based on the pin used vs just the door was unlocked. It says you can create 12 pins and I would like to create a pin and assign to say the cleaning crew, the in laws, the kids etc and I want to get alerted to WHO is entering based on the name assigned to the pin. I already have multiple of the zwave Yale locks that can already accomplish the above mentioned notification but it required having a separate controller and some configurations etc etc. however if the HomeKit lock can do what I mentioned above (and I can get rid of the zwave bridge) I will switch over immediately when they become available. If not, the. I say this is a FAIL! Smart Lock should provide smart notifications. Honest question- how secure is it? To be the best when even the best isn't that good wouldn't make any lock that desirable. If I recall there was an article a while ago covering that subject, and that Apple's instance on over security was hindering adoption. Also they're all more secure then a brick through a window. I've been using the Schlage Sense with HomeKit for almost a year. It was spotty at first, but after many firmware iterations and iOS releases, it's pretty good now, connected thru Bluetooth. Just that the remote Homekit via Apple TV is still slow. You'll get notification for unlocks. And when pin is entered manually, you can check in history the name that you assigned the pin for. Another thing is it's ANSI grade 1. Personally, my preference has been with Schlage. They continue to improve all the time and I like idea of the Pin access. Siri: Idk. Probably some random ***** [S]Microsoft[/S] Amazon picked up from the side of the road. I'd like the product more without the huge Yale logo at the top. HomeKit is the most secure protocol of all smart protocols currently out. Siri: Idk. Probably some random ***** Microsoft picked up from the side of the road.